One of those pesky little items called out in the appraisal of the house that needed to be fixed before the bank will give me my money back was this area on the little deck off the back entry. As far as I can tell there was never a railing here. I’m not entirely sure why, but as a person who starts projects, gets thisclose to finishing them, and then leaves them in a perpetual state of almost-done-but-not-quite for, oh, decades… I can relate. I was still pondering whether or not I should just take a weekend and rebuild the damn thing, but once I made this list I realized it would be a fairly minimal time and money investment to just patch this one up and slap a coat of paint on it for bank approval, and then worry about the rebuild next year. Not that I didn’t shake my head and/or roll my eyes so hard they almost got stuck like that while I was doing it. 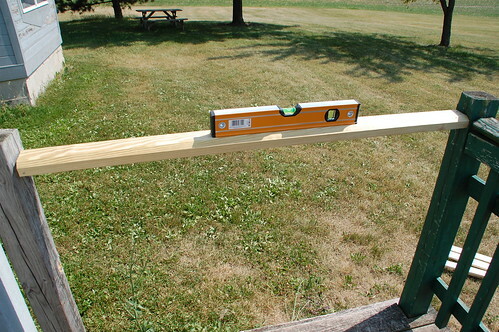 Lowe’s carried the spindles and the hand rail in pressure treated wood, but they didn’t have PT 1×3. 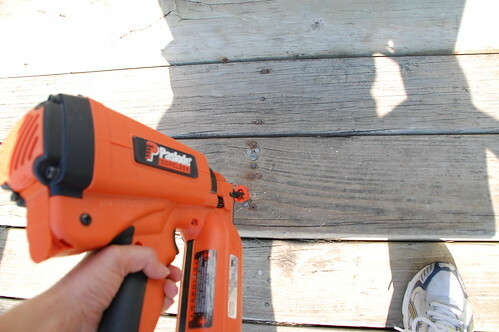 Since this is only temporary and they can hardly disintegrate more than the rest of the deck in the next year, I just used plain pine 1x. 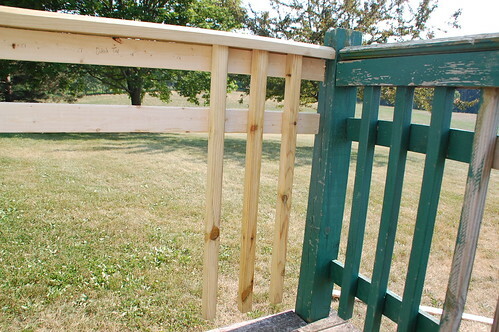 I started by tacking the top rail into place using my cordless finish nailer. 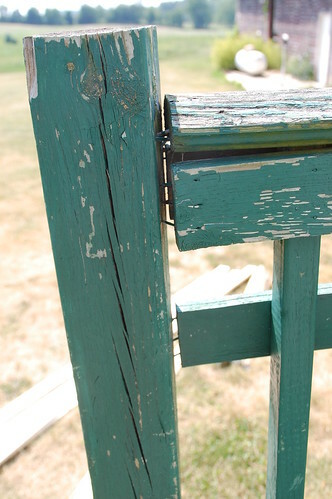 This is in no way to code so do not use this as an example if you are actually building a deck that you aren’t planning to tear down in a few months. 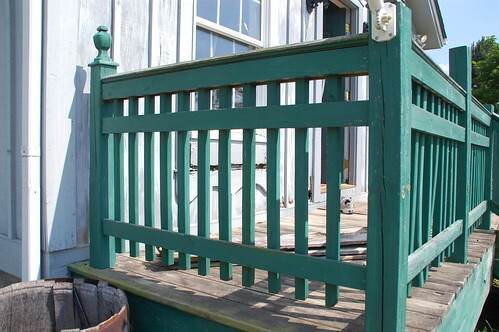 My original intent was just to tack it into place and then finish it up with deck screws, and then I realized I was being insane and creating more work for myself, so I decided the finish nails would be fine. The 4×4 posts are so freaking warped that this looks ridiculous up close. I don’t even like admitting that I built it, but it is what it is. 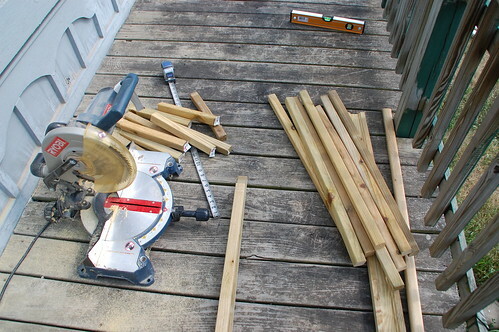 I also had to cut down the spindles. 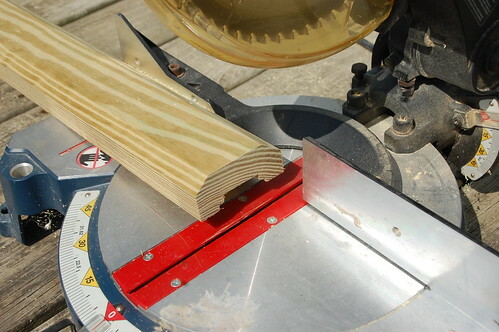 I’ve actually been using my old Ryobi miter saw more than the big DeWalt lately because it’s easier to haul in and out of the house. 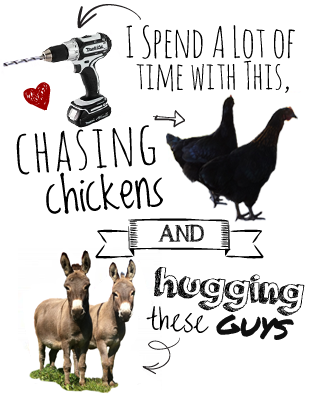 The irony of the fact that I have three barns and no workshop set up is not lost on me. 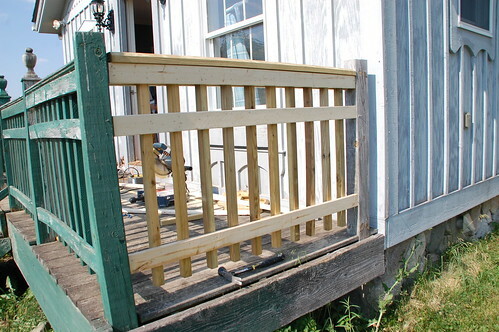 So, to get started I put the top two outside 1×3’s on, and then tacked all of the spindles into place. I found it was easiest to line the top of the spindle up with my mark (4.5″ OC) and put one nail in the top so it could pivot, then use the level to make sure it was straight before tacking it to the second 1×3. And then just to make sure that my not-to-code building methods were still safe, I risked life and limb to test her out. Don’t mind my awesome running outfit. 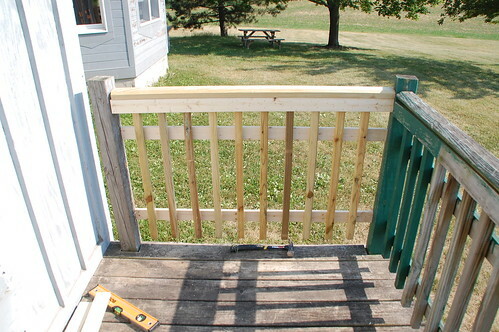 The railing is perfectly sturdy, if not a bit of a hack job. I’m not proud of it, but it cost $25 and took about an hour, so I’m also not complaining. Since I had the nailer out I also tacked down a few loose steps, and holy nails Batman… clearly this has been a recurring issue. 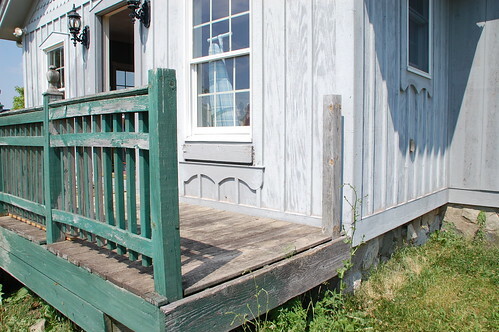 So, a coat of paint, and probably some stain on the decking to make it match the front porch, and we’re going to call this baby done until next year. I am itching to tear her down, but it’s time to move on to the next things on the list. 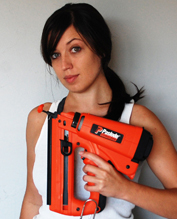 On the upside, you got to use your cordless nailer. So, while you may not love doing something that seems so pointless, playing with toys is always a good time. That’s what I would call “polishing a turd” – but what are you gonna do? It looks great, though! Just a bummer that you can’t have what you really want right now. Good job…just keep thinking “my money out of escrow, my money out of escrow…” Interesting looking foundation under the house. Are those boulders? Mythbuster’s totally did an episode on “polishing a turd”! Of course Blizzard DOTA is free of charge. It’s just a tradition map.